Own this new year. 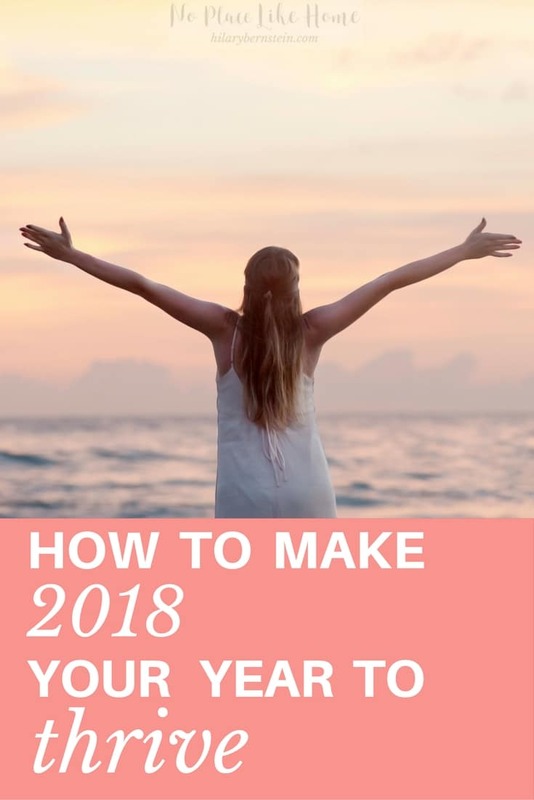 Instead of just surviving, this can be your year to thrive! Here’s how to do it. For the past several years, I’ve started each new year with one word as my focus. It’s been a fantastic way to set the tone for my year and give me direction. Easier than setting a half a dozen New Year’s resolutions I’ll never keep, I’ve thought a lot about a theme for the year as a way to keep focused all year long. As I thought of my one word for 2018, I noticed something about the words in my past: Focus. Back to basics. Relationships. For the past five years, the focus of my years centered on improvement. Because of this, each year I devoted much of my time and energy on making my life better. 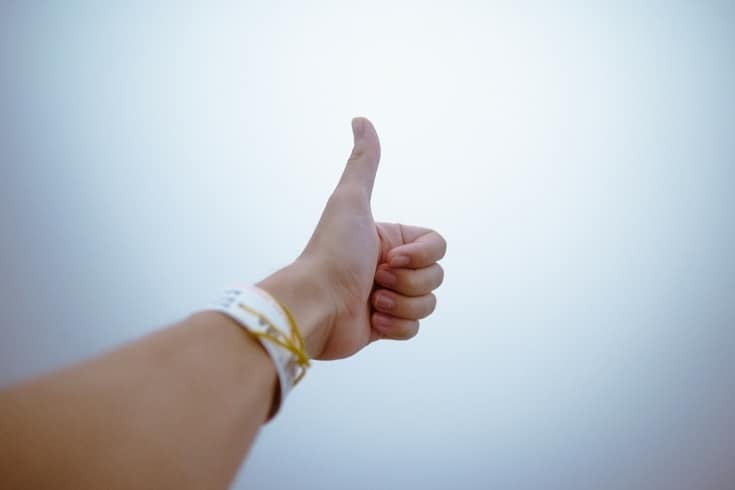 While improvement was needed – and a very good thing – I always reached for something better instead of appreciating and cultivating what I already had. I looked past any successes and kept pushing myself to change for the better. In theory, this should have been great. Who doesn’t need to change for the better? But in reality, I was only concentrating on survival and sticking to safe basics of life. This year, I know I need a change in my perspective. I know I need to thrive. That’s why 2018 is going to be a year to thrive. Just as I need to thrive, you do, too. You need to thrive in your relationships. In your home. In whatever you set out to do. Deep down, you know you want to thrive, but there’s so much in this world pushing against that desire. And there’s so much setting us up for failure. I’ve already determined I’d like 2018 to be my year to thrive. If you feel like you need to get a handle on the basics of life, do that this year. It’s important. But if you’re beyond basics and ready to thrive, here’s the game plan. Step 1: Trust in the Lord. When I think about thriving, I get nervous. Deep down, I know that I can try as hard as I’d like, but real life has a way of happening. And real life has a tendency to be messy – and disappointing. The last thing I want to do is live in fear of what might happen, though. So I’ll press on, trusting the Lord and looking to Him every step of the way. Why this is the first and most important step is this: Life is out of control. And 2018 is totally out of my control (and yours). Because of that, it can seem like thriving is ridiculous. But the key to thriving comes by trusting the Lord as life happens. We may not be able to control what happens in our 2018, but we can control how we react and respond. We can lash out in fear or anger if things don’t go the way we expected. Or, we can remember that God’s in control and we can trust Him with His plan. By turning over our 2018 to Him – and continuing to do that all year long – we’ll find a reason and a way to thrive. Step 2: Focus on seven main aspects of life. Most of life can be divided into seven different aspects. Once you mull each one over, think about your weaknesses and strengths in each aspect. Where do you know you could improve? What’s going really well? Where do you need to grow? Think about your spiritual walk. How would you like to change? What could you do to make those changes? As an example, in 2018 I want to understand God’s Word more and keep applying it to my daily life. I hope to keep studying the Gospel of John and read C.S. Lewis’ theological classics. To help you grow in your spiritual walk this year, I’d love for you to join my free 6 Weeks to a Deeper Walk with God Challenge! What kind of food do you eat … and what kind of food do you know you should eat? Activity-wise, what are you doing to keep physically fit? What products do you use … are they helping or hurting your health? Is there anything you need to ask your doctor about this year? In my home, my family will cut back on our sugar intake by starting Trim Healthy Mama. I also would like to walk our family dog regularly. Think about all your relationships. If you’re married, what do you appreciate about your marriage and what could stand an improvement? If you have children, what would you like to change about your parenting? How much time do you spend with your extended family and your friends? What relationships do you want to invest in? How often do you get to honestly share what’s going on in your life with a trusted friend? For my 2018, I’d like to get together with friends at least twice a month, visit parents once a month, go on dates with my husband at least twice a month, and have separate mother/son and mother/daughter outings once a month. Feeling like your marriage could use a little help? Join my free challenge, 7 Days to Understanding Your Husband Better! Think about the different jobs you have both in your home and outside of your home. How can you challenge yourself to improve? What, if anything, needs to improve in the way you care for your home? With my work, I’d like to complete and apply a new blogging course each month. And I’d like to create several new products that are just perfect for No Place Like Home readers! In my work as a homemaker, I’d like to keep up with my maintenance cleaning and continually passing along what my family no longer wants or needs to avoid clutter. Need help getting your home’s cleanliness under control? I’d love to help you, Join my free 14 Days to a Cleaner Home Challenge! Financially speaking, how is everything going? Do you have an income issue? Are you on your way to debt-free living? Or are you already debt-free and need to keep on the right path? For my family, I’d love to see this become the year that we get out of credit card debt! 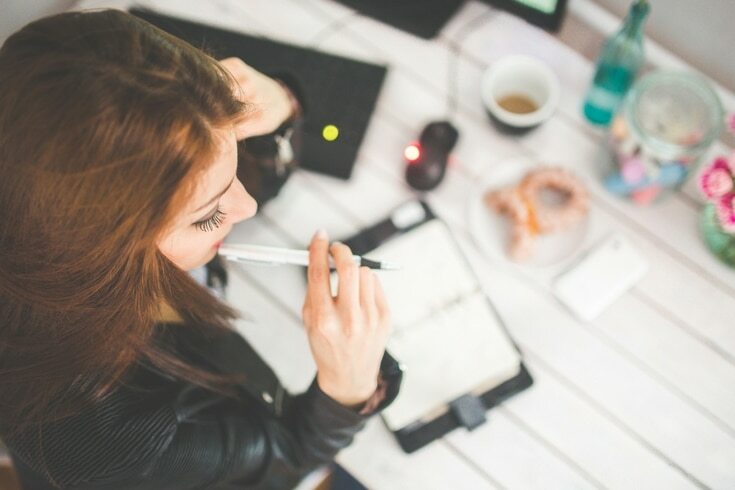 How can you keep your mental focus sharp? What books do you want you read? What new hobbies can you try? For me, I’d like to learn something new each month for blogging and also keep learning as I homeschool my children. I’d also like to read a book each month. Finally, it’s time to evaluate your time. Think about your schedule. What is working well … and what is not? How much free time do you have? If you have too much, what can you add to your life? If you have too little, what can you take away? What do you want to add to each day? When can you fit this in? How are your daily and weekly routines? What needs to change? What’s your biggest time concern? How can this improve? In my days, I’d like to spend more concentrated time with my husband and children. I’d also like to improve the way I stick to a daily routine. It can be easy to feel extra motivated in January. But once spring and summer roll around, all of that excitement and energy can wane … and get lost in everyday tasks. To stay on track, it’s a great idea to look at your goal list again every few months – and adjust it as necessary. As a rule of thumb, taking a few minutes at the start of each new season is a great way to assess everything each quarter of the year. Take these times to refocus and celebrate any way you’ve been thriving. As you seek the Lord’s guidance, evaluate the main aspects of your life, set good goals that will help you thrive, and reassess throughout the year, you’ll work your game plan. And as you do that, you’ll know that as much as the world pushes and pulls, you’re ready and equipped to thrive. What do you want to do in 2018? 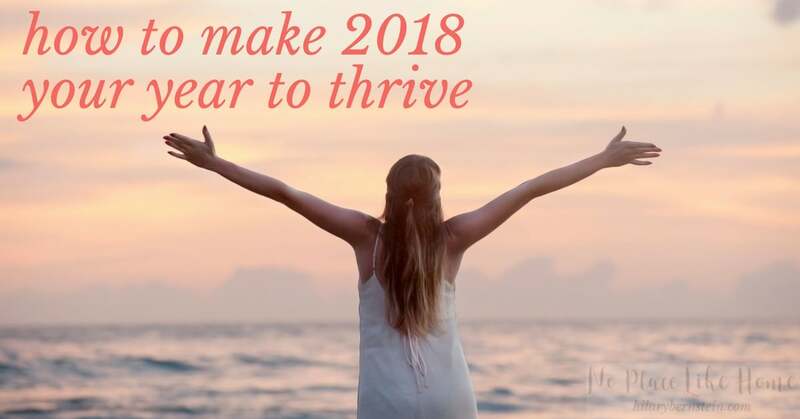 What will you do to make this your year to thrive?